Skype announced today that its new Video Messaging feature is coming out of preview and is available now in almost all of its native apps including iOS, Android, Windows 8, Mac and BlackBerry. The tool gives users the ability to record and share a Video Message to any of their contacts, even when they’re not online or immediately available. 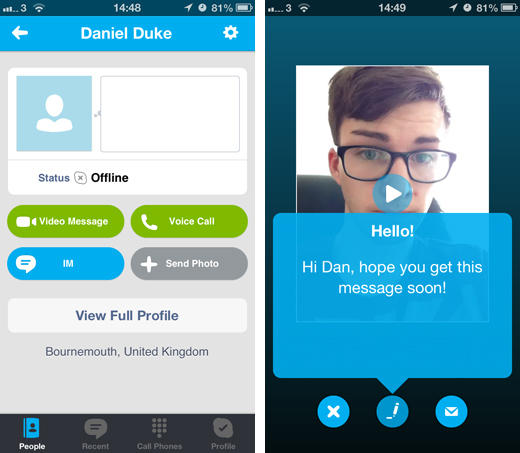 Video Messages are also completely free, and recipients can pick up a missed recording whenever they next log into Skype. The entire process is pretty straight-forward; just tap the ‘Video Message’ button, followed by the record icon to begin a new message. Recordings can be up to three minutes in length and also previewed before it’s sent to the desired recipients. Skype users can also delete and re-record Video Messages at any time, which is particularly useful when contacting someone relatively important. Once the user is happy with their message, it’s just a matter of clicking the envelope icon and waiting for a response. Job done. Skype launched Video Messages as a preview build back in February. At the time, however, it was only available for its Android, iPhone and Mac applications. Microsoft then brought the feature across to its Windows incarnations two months later, before updating it in June with improved stability and notification options. Microsoft needs to stay on its toes at the moment, as there are a number of emerging competitors looking to eat into its existing market share. Google’s new Hangouts app is available as a Chrome extension – and supports group calls with up to 10 people for free – and cross-platform mobile messaging service Kakao Talk is set to launch a PC version sometime this month. Skype is still seen as the go-to service for free video calls, however, and the full roll-out of Video Messaging across all of its apps should help to reaffirm its market dominance moving forward.